When I first received the email from Momastery detailing The Messy Beautiful Warrior Project, I knew I wanted…no…HAD…to be a part of it. You see, the whole reason I started this blog is because of Glennon and the shameless truth-telling and hope-spreading she does everyday when she shows up for her Monkees, as well as the rest of the world. Truly a force of nature that one. With all her brokenness, and honesty about the brutifulness of life, she sets me free over and over again by reminding me it’s okay to let the world see me. Shame doesn’t lie in honesty. Peace does. And when you come clean, you often discover not only are you not alone, but you’re in amazing company…and together we’ll make the best of what’s around. The last part is a line from a Dave Matthews song. I feel the same soul connection to him that I do about G…I’ve just known him longer. Me and Glennon. Completely out of focus and imperfect…but you can see the joy!! This post is about how my broken, messy path in life has qualified me as a warrior and equipped me for future battles. If you follow my blog already (thank you, btw), you may have read this. If not, then welcome! The aforementioned post is not required reading by any means, it’s just a prequel…sort of. But onward we march. I grew up in a small Southern town, where people not only knew each other, but could also greet the skeletons in their respective closets by name. In fact, trying to keep secrets was as useless as a trapdoor in a canoe. Perhaps that’s why, once I managed to recall and assemble the memories from my fractured childhood, I felt perfectly comfortable…even relieved…writing about them for the world to see. Except for one, which continues to haunt me to this very day. In fact, my heart is racing and my hands are trembling as I sit here on Good Friday, about to lay my soul bare just before attending a prayer vigil at church. No time like the present, right? Okay, no more stalling. Me at 8 years old & 3rd grade. When I was in the 3rd grade I had a very good friend–let’s call her Ginger–because that’s not her real name. She lived just down the street from me, so I used to walk to her house to play and vice versa. Although we lived very close, we went to different schools. Her mom worked at a local elementary school, so Ginger was allowed to attend that school because logistically it was easier. The only time we saw each other was after school, on weekends, during holiday breaks or for sleepovers. 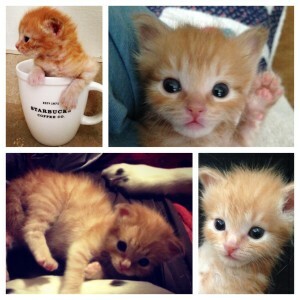 Ginger lived with her mama and adoptive dad. Best I can remember, Ginger’s biological father either died when she was a baby, or was never part of her life. When her mom married Guy (also not his real name) he adopted Ginger so they all had the same last name. Or something like that. Sorry for the hazy details. Maybe that’s what happens when you suppress memories for 30+ years and then try to drudge them up? Anyway, Ginger was the only child in her house. Although her mom and Guy tried to have a baby, I think I remember overhearing Mama say–in a hushed tone– they were unable to conceive. In hindsight, this was perhaps a God-send. What I remember in shockingly vivid detail though, is one afternoon in particular. I was at Ginger’s house, and I’m not sure why…but her mom wasn’t there. Guy was in charge. We were playing in her room and he came in and sat down on her bed. Then he began stroking my very long, straight hair while saying, “Your hair is pretty. If I ever have a little girl, I want her to be just like you”, despite the fact Ginger was sitting right there listening. I’m sure that must have upset her, and evoked resentment. Just writing it makes me sick to my stomach. Sometime after that, could have been days or weeks…the phone rang at my house, and it was Ginger asking me to come over and spend the night. I covered the phone, turned to Mama and explained how I didn’t want to go and “would she please tell Ginger’s mom I couldn’t”? She obliged, and may have asked why I was adamant about not going, but I don’t remember her pressing the issue. Again, it’s all foggy. Eventually they moved away, out of state. I have no idea why. Maybe a change of employment, maybe a guilty conscience. Who knows? Ginger and I kept in touch by writing letters. On real paper, with stamps and everything! Then one day, maybe during 4th or 5th grade, I was in class and the office aide came to get me because my mom was on the phone and needed to speak to me. Thinking about that day still makes me shudder. Mama was calling to tell me that Ginger and her parents had shown up for a surprise visit. Oh, and Ginger and her dad were coming to pick me up from school early! A feeling of panic set in, but I internalized it, careful not to draw attention to myself while standing in the school office. I told her I wanted to stay at school, and begged her not to send them. By then she had to know something was amiss, because let’s face it…what kid doesn’t want to leave school early? Seriously. Nonetheless, they picked me up…but Mama was with them. Thank you, God. After that I don’t remember seeing or talking to them ever again. 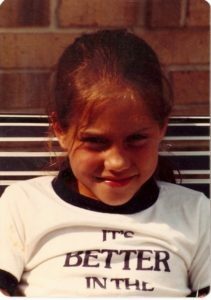 If I had to speculate, I’d be willing to bet both my parents suspected Guy of molesting me, but couldn’t prove it because I was too afraid to tell them anything. Apparently, they decided it best to make sure the friendships were simply severed. Since they lived out of state, it was easy enough to just…lose…touch. Figuratively, and literally. Amen. There are few things in life I’m fearful of. Among them…snakes, water I can’t see through (oceans, lakes, rivers, etc), suffocation (I’ve been in anaphylactic shock numerous times due to medication allergies, so I know what it feels like) and… that man’s face. Yes, I remember it. If he were to pass me on the street, I would stop dead in my tracks. His gaze haunts me, and the sound of his voice in my head is frightening. He is my Boogeyman, but the exact details of why are no doubt lying just beyond the reach of my cognitive memory. Both my parents are in Heaven now, so I can’t ask them what really happened. Nor do I blame them for not pursuing the matter. Living in a small town is both a blessing and a curse sometimes. Thus far, just the flashbacks have made me hyperaware and vigilant when it comes to the safety of The Beans. I’ve made sure they understand never to be afraid of tattling on anyone who makes them feel uncomfortable. Even adults–especially adults. Be warned: come after me, and I’ll fight ’til I fall. Hurt my babies? God have mercy on your soul. My survival is a testament to sheer will, considering all the things I’ve endured, and if this tiny little five-foot-one-inch warrior can walk through the fire of life unscathed, forgiving along the way…well then…so can you. So I guess that’s it. Not a secret anymore, and if knowing I’m a Messy, Beautiful Warrior helps someone else drop their armor and face their own battle then it’s definitely been worth telling. We’ll make the best of what’s around. Put it in the universe. I was going to wait until tomorrow to jump back up on the blogging horse, but then something happened in the car today that reminded me of happy times, prompting me to start early. You are likely wondering why these pictures are leading this post, right? Or not….but I’m going to tell you anyway. The first thing to know (if you don’t already) is I put the ‘fan’ in FANactic when it comes to all things associated with the Dave Matthews Band. I’ve been a stalker fan since they’ve been a band (1991), and have attended an obscene number of shows. There are some very uncanny coincidences associated with my love for all things DMB. ~~ Dave and I were both born on January 9th, although he is 5 years my senior. ~~ He has a song titled “Dancing Nancies” which I used to think was about me, until I read somewhere that it’s about male transvestites in the Red Light District in Amsterdam. ~~ His charity organization is called “The Bama Rags Foundation”. I’m from Alabama, but he is not. ~~ My first choice for college was a small, private liberal arts college in Virginia called Sweet Briar College. I applied and got in, but couldn’t afford to go, and instead accepted a scholarship to the University of Alabama. Dave met his wife at Sweet Briar College. ~~ I haven’t missed a tour since they started doing them, and often attend concerts alone if The Man is busy and I can’t find a running mate. ~~ When I turned 30, I said to The Man, “On my 35th birthday, if we have more money than we know what to do with, will you please hire Dave to play at ‘our’ party?” He said, “Of course, Baby Girl.” **Side note: I did end up meeting Dave, but it wasn’t because The Man hired him, and he wasn’t playing at our birthday party…lol. Through a strange twist of fate, a dear friend was able to hook me up with a gig working as an extra on the single episode of “House” Dave played a role on, and ironically enough…we taped the day after I turned 35. I made sure to introduce myself, even at the risk of being tossed off the set. He knew exactly who I was (apparently he’d been told I would be there?) and wished me a happy belated birthday. 1. 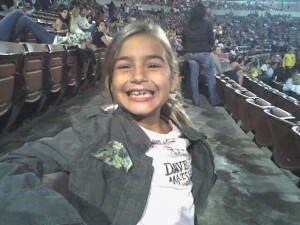 These pics were taken in 2007, on Sugar Bean’s 8th Birthday at Verizon Wireless Amphitheater in Irvine, CA. 2. About 3 weeks before these were snapped, a publicist friend of mine who knows of my obsession, called and said he was having brunch with another friend who used to be Dave’s publicist, and wondered which show in LA I was attending on that tour, in case she still had connections and could set up a meet and greet. I told him the show in Irvine, because Sugar Bean was going with me as her birthday present. Unfortunately, he called a few days later and said she no longer had an “in”. No worries. 3. Exactly 2 days before the concert, while I was in hellish traffic on the 405, my cell phone rang. 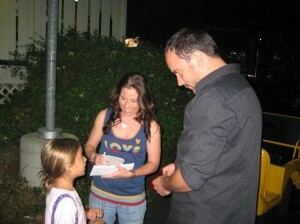 I answered, and a girl named Lauren said she was calling from “The Warehouse” (the official DMB fan club…which I am a member of) and wondered if I was attending the show in Irvine later that week. I told her I was planning on it, and then she asked if I would like to meet Dave before the show. I think I muttered something to the effect of “Oh holy hell…did Alfred put you up to this?” She said she didn’t know an Alfred, but my name had been randomly selected by the fan club as the winner of a pre-concert “meet & greet”…for reals. I continued to grill her, until I was satisfied I wasn’t being Punk’d, and promptly wet my pants, grinning from ear to ear all the way home. YES. THAT REALLY HAPPENED. 4. I took that t-shirt away from her once we got home and promptly stored it in an air-tight container. It’s never been washed and she will only get it back at my death. Proof positive that it pays to put things into the universe if you REALLY want them to happen, huh? Now…why am I telling you all this? Because I want to. And because it’s relevant to the happy time I was reminded of today in the car. Each time I gave birth, I was listening to music through headphones. Guess what artist was playing? 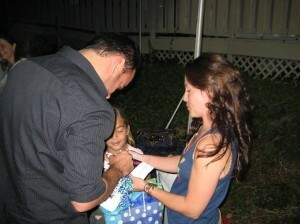 If you answered “Dave Matthews” you win a gold star! Now, in fairness to each individual life I brought into the world and because each of the The Beans has her own unique personality. Despite the fact, I didn’t know what each bundle of joy would be like once she was born, I chose a different song for each one, and put that on repeat until they entered the world. They all know what their song is, both by name and when they hear it, as well as what their sisters’ songs are. Call me crazy, but it’s an important detail in my estimation. BB: This is SB’s song!! SP: What’s my song again? SP: Right! Now what is that song about? Princess Rapunzel, or another Rapunzel? BB: Mama, what’s it about? Me: Oh…I’m sure it’s about Princess Rapunzel (smiling devilishly). Thank God they didn’t inquire about the meaning behind ‘Jimi Thing’, right? Every so often, I’m invited to cool events as the result of my incessant over-sharing here at a calibama state of mind. Some are blogger networking soireés, others are invitations to be part of the audience for a talk show, and others are opportunities to attend private screenings of great films before they are released. That’s what happened last week, and the film sent such a positive message, I want to tell y’all about it so you won’t miss it once it opens in theaters this Friday! 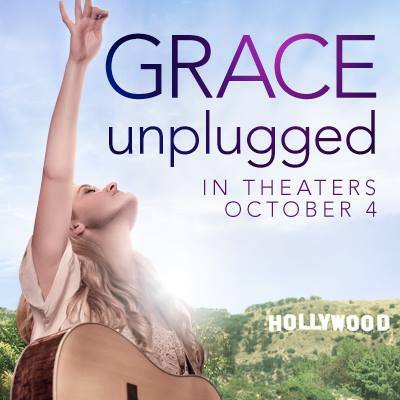 **A talented young singer and aspiring songwriter’s Christian faith and family ties are tested when she defies her worship-pastor father and pursues pop-music stardom in GRACE UNPLUGGED, a moving and inspiring new film that explores the true meaning of success. 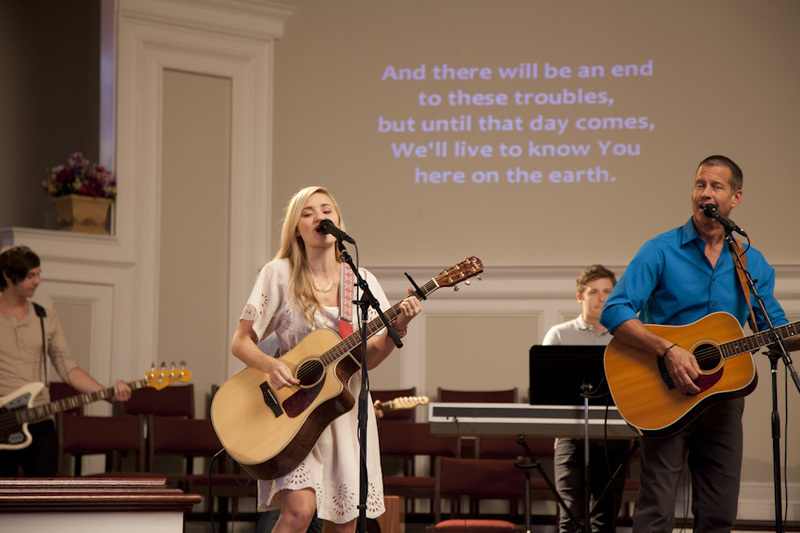 Grace Trey has just turned 18 and aspires to do more than sing in her church’s worship band, which is led by her father, Johnny Trey, a one-time pop star who gave up his life in secular music when he became a Christian. Grace longs to escape his shadow and make a name for herself singing songs about something other than God, but Johnny warns her that fame is not as glamorous as it looks and reminds her that serving and worshipping God with the talent she’s been given is a far more worthwhile goal. When Johnny’s former manager, Frank “Mossy” Mostin shows up 20 years after the two parted ways to offer him another shot at the big time, Johnny declines the opportunity. But Grace takes it – without telling her parents. She records a cover version of her father’s old Top 10 hit, runs away to Los Angeles and, under Mossy’s guidance, begins to taste the kind of success she’s always dreamed of, landing on the charts herself, attracting the attention of the entertainment press, even dating a popular TV star. But with each rung of the ladder she climbs, Grace feels pressure to compromise her Christian values, and her relationship with her parents gets further strained. Even as plans move forward for her to record a follow-up album, Grace learns not everyone who says they’re on her side really is. The one exception is Quentin, an intern at her record company and a fellow Christian who urges Grace to reassess her choices and put God first again in her life. Will everything she experiences lead her to reject her faith … or …rediscover it? Ironically, the screening was scheduled for last Wednesday evening, which happened to be not only the eve of Sugar Bean’s 14th birthday, but also the night she attends her beloved youth group meeting at our church. And as much as I adore attending a private screening (and even more so the party that usually follows) I must admit, when Sugar Bean opted to attend youth group instead of the movie, I smiled a bit. Okay, a lot. Because raising a teenage daughter in LA is really tough, and there is always a moment of pride when you are presented with unequivocal evidence your angel has her priorities aligned properly: God, Family, and Fun. In. That. Order. Our very important scheduling conflict did not, however, mean all was lost. Thanks to the miracle of modern technology, and a great girl named Briana at Grace Hill Media, who hooked me up with a digital link, and provided me with log-in credentials…we were able to enjoy the film from the comfort of our own home, snuggled up together in our jammies. And it’s such an amazing, feel good family flick, that was an outstanding way to experience it. Quality mother/daughter bonding time is always sheer perfection! And the icing? The film is partly set in Birmingham, Alabama, which is not far from where I grew up, so I recognized the scenery. That’s always fun! Anyway, the film itself is just the kind of movie I love to show The Beans. It’s packed with teenage angst, disobedience and rebellion. Wait…what?! Did I just say that? Yes. Yes I did. It’s incredibly relatable, and the rebellion is dealt with sensibly; emphasizing faith, family and the importance of remembering your roots, following your beliefs, maintaining strong morals, and trusting God to lead you along the path to where you belong. It’s packed with teachable moments. Yes, it’s a Christian film. But it’s much much more than that, so don’t shy away from seeing it, even if your spirituality and faith is rooted elsewhere. Because with all the horrifying images and behavior exhibited these days by the very pop stars whom our youth once viewed as ‘role models’, this movie is a gust of fresh, clean air our children can breathe in and be inspired by. The character of Grace Trey is just the kind of girl anyone would be overjoyed to have as a daughter, and fortunately….I’m pretty sure I’m raising three of her, with help from positive works of cinematic brilliance like GRACE UNPLUGGED. Starring AJ Michalka, James Denton, Kevin Pollack, Shawnee Smith, Michael Welch, and Jamie Grace, GRACE UNPLUGGED arrives in theaters October 4 from Lionsgate and Roadside Attractions. Inspired by a true story, GRACE UNPLUGGED is directed by Brad J. Silverman and produced by Russ Rice, the team behind NO GREATER LOVE. **Denotes synopsis provided by Grace Hill Media. All images provided by Grace Hill Media, with permission from Lionsgate and Roadside Attractions. The opinions stated here are entirely mine, and mine alone, and I did not receive any monetary compensation in exchange for my review.